I always love the arrival of apple season as it brings with it such warm and wonderful fall flavors, and baking these caramel apple cups fills the kitchen with joyful aromas. Apple, cinnamon, caramel… they warm your heart before you even take a bite. Since they’re so easy to make, you’ll have them in your belly before long too! Start by cutting up a package of refrigerated biscuits into pieces, and you need those oversized biscuits, not the little wimpy ones. 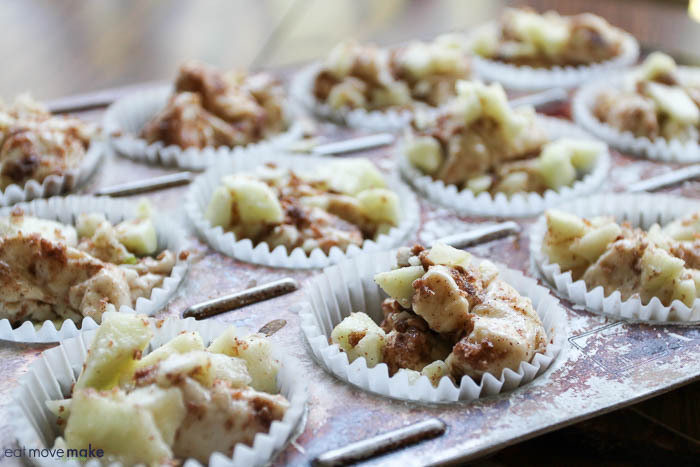 Stir in chopped apples, melted butter, sugar and cinnamon and spoon into muffin cups. Oooo, this is gonna be good. 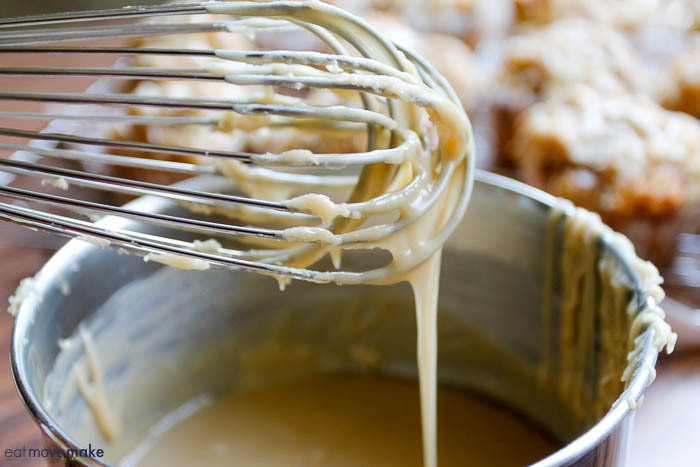 While the caramel apple cups are baking, prepare the caramel apple glaze on the stove. When the caramel apple cups are done baking, drizzle the glaze over the top and serve while still warm. If you can’t serve them while warm, don’t panic! They’ll still taste great… it’s just that warm apples and cinnamon are always a special treat. Plus, you can pop them in the microwave for a few seconds if you want to recapture some of that magic. Heat oven to 350 degrees. Line a muffin tin with paper liners. Cut each biscuit into 6 pieces; place pieces in large bowl. Add butter, apple, sugar and cinnamon; toss to coat. Spoon into lined muffin cups. Bake 20-25 minutes or until golden brown. Remove from pan. While baking, mix brown sugar and cream in small saucepan over medium heat. Bring to a boil, stirring constantly. Remove from heat. Whisk in powdered sugar until smooth. Spoon warm icing over warm caramel apple cups. Enjoy! These caramel apple cups are delicious. What an amazing looking treat! Sharing! Thank you for sharing on Merry Monday! Hope to see ya next week! Clever idea. I will make these for sure. Thanks. What a great way to use refrigerated buttermilk biscuits! These look absolutely delicious! Do you know how they would do with homemade buttermilk biscuits? I sometimes buy biscuits, but also often make my own. I imagine the baking time would alter a bit, but it would be an experiment worth trying! 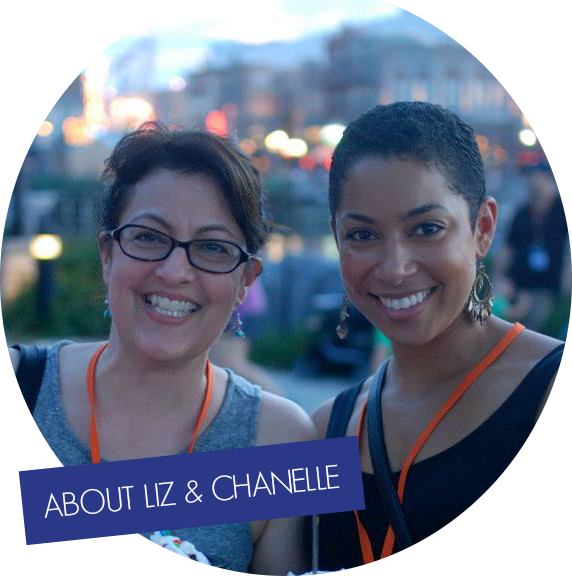 Saw this on the Share Your Style Link Party and can hardly wait to try it. Man do I love me some apples and caramel! Yes, yes and yes again! Your pictures and this recipe are fantastic, thanks for sharing. Mmmmm! Caramel and apple are so good together. I bet these are amazing! I adore all things summer, but there’s something special about the warmth of fall flavors. These caramel apple cups have me looking forward to the change of seasons. We’re almost at the Apple Jack Festival time in Nebraska City! This is a great recipe to try. I too love the smell of apple in the kitchen. I love apple pie but I have never tried this recipe before. It looks delicious. This recipe has me craving fall weather, and apple picking. They look so good! I can’t believe it’s almost apple picking season! These look delicious! Now this one looks scrumptious and I love that it’s easy to make! It’s perfect for Fall too, especially for Thanksgiving. It makes preparing the other dishes easier! Seeing this recipe made me excited for fall! I love caramel apples and so do the kids and it would be easier to eat it like this. I cannot believe I never thought of preparing it this way! 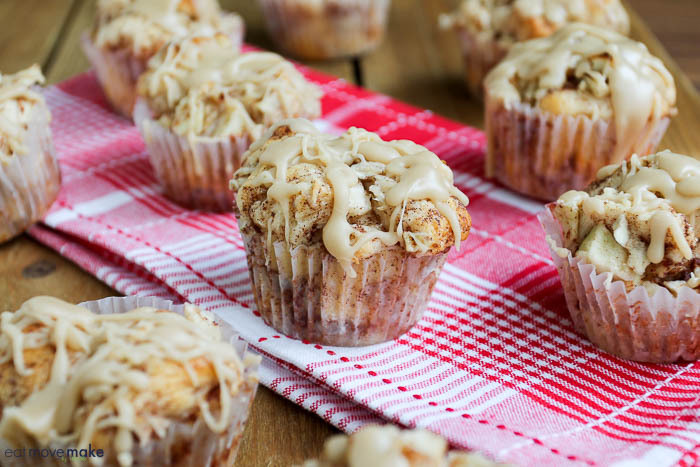 Yum… they almost seem like a muffin but yet sort of a like a dessert. Whatever they are… they look and sound delicious! Caramel and apple is always a good combination for sure. Sweet and simple. I will have to make these cups, I am sure they would make a wonderful mid day sweet treat! I am drooling over your photos! These caramel apple cups look so delicious. They’d be good for any time and any occasion – From breakfast to dessert to game day snacks or to pair with tall glass of iced tea. Thanks for sharing the recipe. How yummy do these look!? I want to make these now and hide them from the kids! These are going on my must make list. The look so delicious. I can’t wait to try them. Fall and apple season is coming. This looks great. I am so ready for fall after I’ve been sweating for what feels like forever. These caramel apple cups sounds delightful! I make something very similar and my family goes wild for them! I can’t wait for apple season! Well, this looks REALLY GOOD! I need to recreate these – especially for fall! Oh I am pinning this because they look DELICIOUS!!!!!! When we go apple picking I end up with so many apples, so this is perfect. I am always looking for new recipes to try. Oh my these caramel apple cups looks so delicious. I am sure they will be a big hit in my house. Apple season is my favorite. There are always so many delicious recipes I want to try, and now I’ll be adding these Caramel Apple Cups to the list. They look divine! YUM! I totally want to make these now, they look so soft and moist. 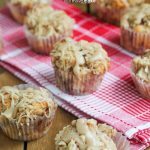 Moist muffins are the best! 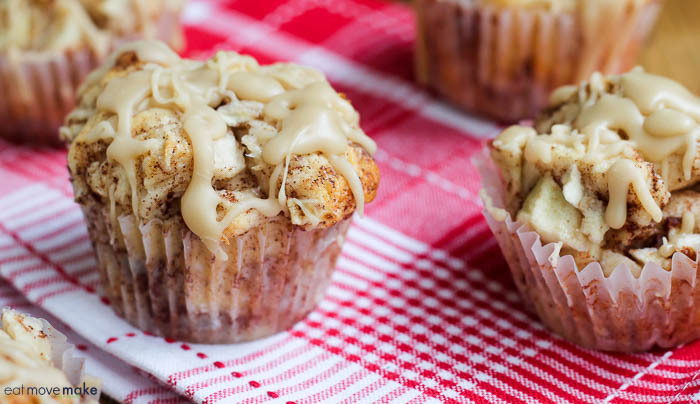 These yummy muffins just scream Fall. Looks so good! My husband loves homemade apple pie. It is just a pain to make. These would be a perfect compromise for that issue! Brilliant! These look so good. I can’t believe it’s already time to start thinking about fall recipes like this. Ooh easy and yummy. These look really good. Yummy! Those look really tasty and totally perfect for the upcoming apple season. I am so ready for the tastes, smells, and temperatures of autumn. Your caramel apple cups sound super yummy for a fall day! Those look so good I wish there was a way to eat them right off the screen! I never thought of making them this way but I can going to do this really soon! Those look so amazing! I love how easy they are to make and eat. Putting them in little cupcake cups is pure genius. Oh my goodness!!! These look so delicious! I would probably get in trouble if these were in my house. Oh my YUM! Your Caramel Apple Cups look and sound heavenly! And quick and easy to make too. Perfect for back to school breakfast and snacks. Thanks, Liz! Oh man these sound so good. 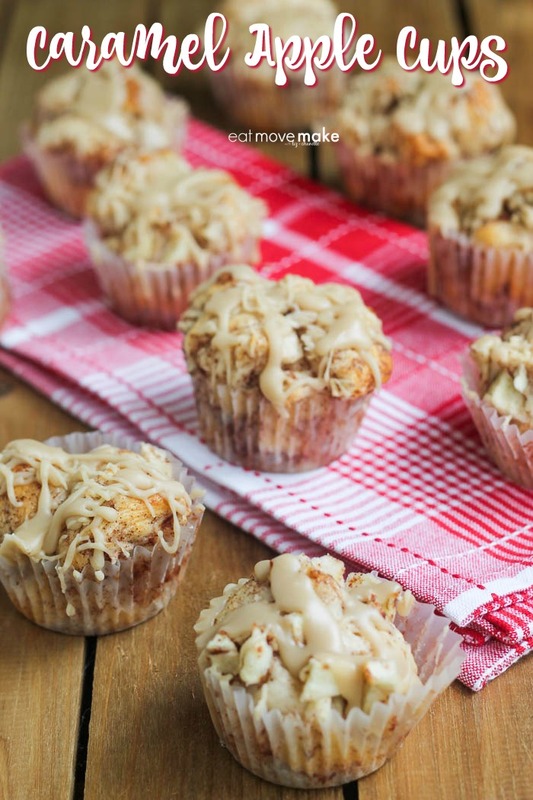 I love apple recipes and we will be going apple picking soon so this is perfect timing.